Pepys Street short lets apartments are set in the heart of the City of London, an amazing labyrinth of financial institutions and eye catching historical monuments. Located in a quiet side street behind the Tower of London, this newly built serviced accommodation comprises one and two bedroom contemporary furnished apartments. 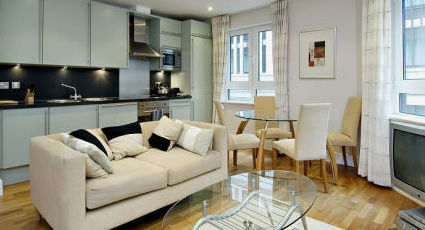 These short let apartments are designed to suit both holidaymakers visiting London and business travellers wanting a comfortable and convenient base in the "Square Mile". Pepys Street short stay rentals offer bright and relaxing living space with broadband Internet facilities and modern kitchens equipped with washer/ dryers and dishwashers ideal for self-catering. The list of Londons iconic sights in the vicinity of Pepys Street serviced apartments is impressive: the Tower of London with its 900 years of history; the majestic Wrens St Pauls Cathedral; the Tower Bridge - a showcase of Victorian triumphant technology and St Mary Axe - a modern building and the latest London landmark - to name a few. Tower Hill underground station (District & Circle Lines) and Tower Gateway ( DLR for Canary Wharf) are a just a short walk away from the apartment block. Excellent bus services connect the area with Holborn, the Strand, Covent Garden, Liverpool Street and Oxford Street.